As the fall cross-country season approaches, high school runners can be seen training anywhere there is a semblance of a trail -- and plenty of places where there isn't. But few local runners had wilder training runs than Monta Vista's Pearl Law. The senior spent her summer in Tanzania doing volunteer work, and when she tried to get some summer training in, she found herself in awe of her running partner, who was one of the volunteer program's guides. "It was so different because he was running barefoot," Law said. "We were running over thorny plants, dirt roads and rocks, and he wasn't bothered." Law also discovered that what she viewed as training, the locals viewed as a way of life. "People were just running while doing physical labor," Law said. "For them it's a way of getting work done quickly. They were training like we do every day, and didn't realize it." Law's volunteer group helped out at an orphanage and built part of a school. It was there that Law was able to fulfill the wishes of her coach, Kirk Flatow, who has focused on community service since taking control of the Monta Vista cross-country program. When Flatow was hired, Monta Vista Principal April Scott asked him to make the athletic field an extension of the classroom. He brings in motivational speakers and has set up trail-rebuilding projects for his team, and when Flatow and Law were discussing her upcoming trip, they decided that she should take 20 Monta Vista jerseys with her to donate to children in Tanzania. "I feel that this team should be more than just an athletic team," said Flatow, whose boys and girls teams are among the leaders in the Central Coast Section Division I rankings. "Our goal is to be more than a program that can win. I want our athletes to feel like they are part of something bigger." Law got that feeling on one of her final days in Tanzania. In a country where clean water is considered a luxury, Law's gift to the schoolchildren made her a popular volunteer. "I took the uniforms out of a bag and the kids literally swarmed me," Law said. "All the stuff we take for granted is gold over there. It really opens your eyes." 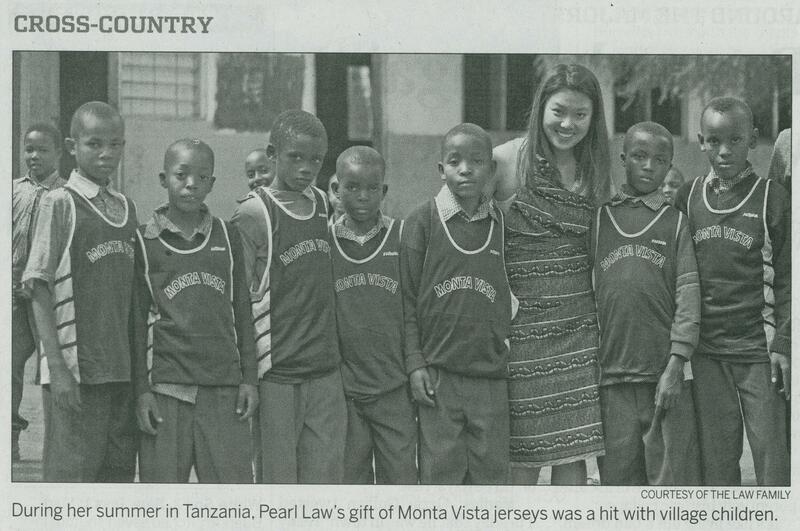 Throughout her 24-day trip, Law learned about what she and her Monta Vista teammates take for granted on a daily basis. Forget about Facebook or cell phones -- while in Tanzania, even simple things like showers were hard to come by. "You learn a lot about how much you can stand," Law said, smiling. Back with her Monta Vista teammates, Law hopes to learn how well she can run this fall. She's one of just two senior girls on Monta Vista's team, which is led by promising freshman Jenny Xu and senior Kevin Bishop, the 3,200-meter champion at last spring's CCS track and field championships. It was during track season that Flatow discovered Law, a late bloomer who has developed into one of Monta Vista's top runners. "When I first saw her run, I was disappointed that she was a junior when she joined the team," Flatow said. "Now I'm just really glad she came out."